First a look at Utah Code for bike lights. If you don’t follow the law you could at the very least receive a citation. At worst you could be involved in an accident in which any settlement is severely reduced because of lack of adequate lighting. 41-6a-1114. Bicycles — Lamps and reflective material required. (ii) red taillight designed for use on a bicycle and emitting flashing or non-flashing light visible from a distance of 500 feet to the rear. (b) in lieu of reflective material, a lighted lamp visible from both sides from a distance of at least 500 feet. (3) A bicycle or its rider may be equipped with lights or reflectors in addition to those required by Subsections (1) and (2). 41-6a-1603. Lights and illuminating devices — Duty to display — Time. (1) (a) The operator of a vehicle shall turn on the lamps or lights of the vehicle on a highway at any time from a half hour after sunset to a half hour before sunrise and at any other time when, due to insufficient light or unfavorable atmospheric conditions, persons and vehicles on the highway are not clearly discernible at a distance of 1,000 feet ahead. Also, having only helmet lights, without lights attached to your bike, are not in accordance with Utah code as I have been told from a reliable source. Apparently there have been citations issued to cyclists involved in nighttime accidents for failure to have proper lighting. From my personal experience, I would suggest a front light with a minimum of 250 lumens. A lumen is “a measure of the total “amount” of visible light emitted by a source,” according to Wikipedia. Another definition measures the light from a source falling on a surface in one second. All lights should be measured in lumens now, a change from watts, which measures the consumption of electricity. From what I have read, not all lumens are alike. Bicycle Times (Issue 14) stated that reported lumen output might be based on theoretical output of the LED’s. Like most purchases, if it sounds too good to be true (a lot of lumens at a very low price), maybe it’s not. How lumens go from theoretical output to actual output may have to do with the reflector unit that houses the LED. Perhaps the message is to buy from reputable companies. You need to be seen and see the road, especially in the winter when there is precipitation or ice on the road. I have only my experience to recommend a 250 minimum lumen level. I also recommend a backup front light of any lumen. This light should have a flashing mode that is particularly helpful at dawn or dusk, or when there is competing light sources such as in commercial areas. I currently use a 120-lumen Light & Motion VIS360 mounted to my helmet as my backup light. (see side column for a review of this light). I also have 3 rear lights including the rear helmet light that is part of the VIS360 package. With every upgrade of lights I ask myself, why didn’t I do this sooner? I ride upwards of 100 nights/year so a good light system is important to me. I also ride at night when there is ice, rain, snowstorms, etc. So another reason for me to look like a Las Vegas casino on the road. Most cyclists may ride in less inclement weather than I, but remember it is still dark and you need to see and be seen. But you may feel your requirements are less than mine. Currently I use a NiteRider TriNewt, a nearly 500-lumen light with 3 LED lights that is no longer in NiteRider’s product catalog. The Manufacturers Suggested Retail Price (MSRP) of this light when I bought it was $400 plus over $200 for a backup battery. It is super bright, lights up the road well and has been my favorite light for the past 4 years. For the purpose of this article, I have been fortunate this year to be given a new light in the 2012 NiteRider product line, the MiNewt.600 Cordless. This light, as the name suggests, has 600-lumens of output. Most appealing to anyone thinking of buying a light is the price, $150 MSRP. That’s correct, a more powerful light at less than 40% the price of my TriNewt of 4 years ago! If this is still too much money, consider the $110 MiNewt.350 Cordless or the MiNewt Mini.300 for less than $100 (which is lighter than the cordless models). I like lights to illuminate my way with a somewhat wide optic lens, so I was a little concerned about the narrow light source of the cordless models. I have been very pleased with the MiNewt.600 as it bathes the complete travel lane and part of the oncoming lane of traffic in light, nearly as effectively as my TriNewt. The light from the NiteRider 600 is a little softer (not as bright) than my TriNewt, but certainly effective enough to be seen and see the road with confidence. Battery life at 600 lumens is 90 minutes, but you can effectively save battery time by using the 400 (3 hours) or 275 (4.5 hours) lumen settings, something that my TriNewt doesn’t seem to do as well. Another plus is the cordless design. It is small enough to easily unclip from the mounting bracket and put it in your pocket. I also finally went out in a February snowstorm to try it out. It worked well, giving me a lot of confidence riding in the storm. Full charging of the 600 Cordless takes 5.5 hours via a wall outlet or USB port of your computer. Being a computer idiot, I always have my Apple laptop plugged in so I am puzzled why someone would need to charge a bike light from a computer without an available wall outlet. 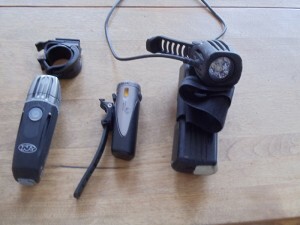 If 600 lumens is not enough for you, NiteRider has a 750, 1500 and a mind-boggling 3000 lumen light. My wife complains that my TriNewt is blinding and won’t use it (She also rides up to 100 nights/year. She uses and loves her 10 year old Commuter Pro from NiteRider, a hand-me-down that I once used). She is correct, the light of the TriNewt is blinding if you stand in front of my bike. I’ve had a couple of cars blink at me to turn the light down. The 600 Cordless has a softer light, bright but not blinding. I’ve had several comments on “nice light” for the 600 NiteRider as well as the TriNewt, but I’ve also had “turn it down” remarks on the TriNewt. The Cordless 600 has a couple of features that my TriNewt doesn’t have. One, it has a helmet mount option. Secondly it has a “locking mode”. 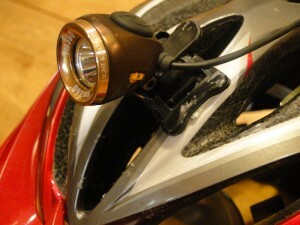 NiteRider states: It is highly recommended that the light be put in lock mode during transport of the headlamp in order to prevent accidentally turning on of the headlamp. Once during the test period I thought I had locked the light only to find it discharged inside of my pannier when I checked it. The light will come on with a slight bump if not in the locking mode. Fortunately I had time to charge it before I needed it. (I am not the first reviewer to take issue with the locking mode, see Bicycle Times issue #14) This is another reason for a back-up light, or in the case of the 600 Cordless, taking care to lock it properly. I also perceived a dimming of the light when the battery was nearly discharged. Perhaps it was just my perception, but a concerning problem. I was also able to use the Light and Motion Urban 500. It is a 500-Lumen light, smaller and more compact than the NiteRider 600. Don’t let its size fool you, it puts out plenty of bright light equal to my TriNewt. At times during my commute I would switch from the NiteRider 600 light to the Light & Motion Urban 500. I sometimes thought that the Light and Motion was a tad brighter though this is subjective. If you go to the Light and Motion website, the “light test”, you may not see much difference but on the road, there seems to be a little more brightness. The Urban 500 comes with sidelights making it a “more legal” light. The mounting to my handlebar was easy. It has a 90 minute run time on high, 180 minutes on medium and 6 hours on low plus a flash option. Switching from one setting to another is easy. There is no lockout and I did not have any accidental discharge of the light. The Urban 500 is recharged via a USB port and for $20 you can buy an after market plug, an option that should be included with the light in my opinion. A helmet mount option is included. The Urban 500 has a $159 MSRP, a negligible increase compared to the NiteRider 600. Light and Motion also makes an Urban 300 at $129. The one issue I have with Light & Motion Lights is the lack of an instruction manual. I’m old-school, I like written instructions. I have little idea what the little pictures on the box mean. Maybe this is a picky point for most consumers, but consumers come in all sizes and shapes. This would certainly help bike shops that may be asked to answer questions that a simple written instruction manual could avoid. Overall, do I like the Urban 500 more than the NiteRide 600? Let’s just say that I would buy either light sold by my local bicycle shop. Currently it stocks NiteRider but I have strongly suggested to my son (the buyer for the shop) that he should consider the Urban 500. I also had the pleasure of trying out a VIS360 courtesy of Light and Motion. This is a very light, at 130 grams, helmet light that has a 120 lumen front light connected to a rear facing flashing light. Although I have stated that one should use headlamp of at least 250 lumens, the front light of the VIS360 is quite bright and does a very adequate job of lighting up the road, so perhaps I should tone down what may be called subjective bias. 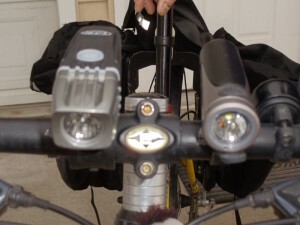 In addition the headlamp has small sidelights that will satisfy section 2 (b) in the Utah bicycle lighting code (see above). This is the first helmet-mounted light that I have used. I couldn’t even feel the light on my head. It has 3 settings, high, low and what I primarily use, flash. I can now, in camera parlance, point and shoot at a car coming to an intersection perpendicular to my route of travel. Once, I was trying out a handlebar mounted flashing light and turned off the helmet light. Within a mile of doing so an SUV slowly went through a stop sign nearly into the intersection I was in. I felt unprepared as I turned to the car without my flashing helmet light. The light charges only via a USB port as packaged. Charging the light was the first time I ever used a USB port just to show you how computer challenged I am. No problem, even I could charge it up. Charging is not needed very often as the battery lasts 15 or 20 hours, in the flash mode, depending on which part of the website you are reading. Their website also states in one section that the front light is a 110 lumens. The rear flashing light is also very bright and will stay bright until the battery fully discharges. Too many times I see solitary rear lights powered by disposable batteries appear to be on the last bit of battery life, making them useless and giving a false sense of security. The VIS360 eliminates that problem and will add a second light to the back of your bike, another one of my “minimum requirements” for night riding. Another plus is the rear light is high. This avoids obscuring a seatpost mounted light when grocery shopping as I have done on more than a few occasions due to overbuying! I have a light mounted to the rear of my rack for this purpose before I received the VIS360. This is a good combo light to buy if you are looking for a helmet-mounted light to add backup lights to your current system. Could it be your primary light? I will say no, and as I mentioned in the above in the NiteRider section, having only a helmet light may not meet state code. In a recent Momentum Magazine article there was a quote that “helmet lights should be an addition to, not instead of, front and rear mounted lights”, and this statement was made without the legal status of helmet lights involved in the discussion. The only complaint of the VIS360 from another reviewer is the price. At $170 it is higher than other comparable front headlamps, but this also comes with a rear light to make the price more tolerable. Personally it is a good package for your nightly commute. Vis 360 now offers the rear light to turn off. The Vis 180 MICRO is $49.99. A cool new light is Taz, 1200 lumens and an internal battery just like Urban but with serious output. That light is $299.99, the TAZ 800 is $249.99. I would like to thank my son Ben @ Millcreek Bicycles and the Light & Motion rep Daryl Price for providing me with this light. For more on Light & Motion, visit bikelights.com. One Response to "It’s Light Season: It’s Time for You to Get Illuminated"
Its great to see high quality lights coming down in price over time. But for the love of everything that is good, at least use SOMETHING. I’m shocked how often I see people riding after dark with exactly nothing. Even a cheep $20 light is better than that. But then again, I’m guessing those folks don’t read this blog. Anyway thanks for the review. Always fun to read about the new goodies out there. I’m a big fan of the dynamo setup. Great output now with LED. Haven’t had to worry about batteries in two years.